No it isn’t a “Honey-do” list, but just some reminders before the season gets away from you! As it often does for me…. This is a great month for planting things- the still warm weather means that plants can get settled in, and the autumn rains are coming which should give everything good rooting conditions. Time to get peonies in the ground, a reminder also included in the September garden tips. Most trees and perennials may be planted now. 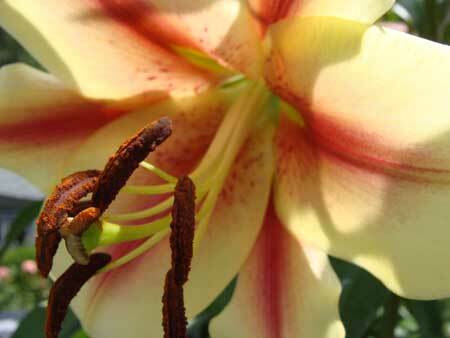 See the picture of that lily I snapped this summer? I would like to plant some bulbs of that. Garden tools are often on sale. I like picking up those that need replacement or hose attachments now. I’m going to have to do that this year- as “how do they manage to do that?” my ‘garden helpers’ somehow broke the last of the sprinkler attachments. Must have banged it against a rock…hard. -perhaps many times- I wonder if that qualifies as a stress reliever? Like in some movie where they were shooting old toilets with a shotgun…anyone remember that movie? Of course, spring blooming bulbs… that is the big thing now. Don’t expect there to be good supplies or sales late in the season this year.